I said it before, but the fact is we eat too much and we eat too much of the wrong things! And it’s a problem not only in America, but globally. Obesity increases the risk of cancer, coronary artery disease, type-2 diabetes, and stroke. Obesity has been cited as a contributing factor to approximately 100,000-400,000 deaths in the Unites States annually. The sad part about these statistics is that obesity is easily preventable and reversible. It really only takes some discipline and a little effort. In this article I am going to demonstrate how just by cutting back the amount of food you eat can help you lose weight and lower inflammation. Remember, it’s the inflammation that is responsible for so many of our problems. And, by pushing your first meal out a few hours will rapidly intensify weight loss further lowering inflammation! I’m pretty sure that most of you reading this know what causes and/or contributes to obesity: poor diet, overeating, lack of exercise, and medical conditions. In the last post I shared a chart that broke down the good and bad foods we eat, and it was pretty disturbing. The majority of Americans eat a lot of sugar and fats and very little vegetables, fish and lean meats. A diet that is rich in sugar and unhealthy fats is setting you up for a whole host of very serious health conditions over time. In my next post I will focus on dieting for fat loss and overall health and will link back to this post when it’s complete. Most of us believe that lack of exercise is a contributing factor behind a poor diet as the leading causes of obesity. However, one study at Stanford showed that lack of exercise, not diet, was linked to obesity. The fact is exercise is one of the best ways to keep fat off! And it doesn’t take much. A quality exercise program that combines weight training and cardiovascular training will build muscle, which in turns burns more calories and cardiovascular exercise to burn fat. In the coming posts, I will outline some exercise routines that anyone can start doing immediately, and will link back to this post. Some medical conditions and medications can cause weight gain. Since I am not a doctor, and not knowledgeable on this subject, I am not comfortable writing on it, but I will share four conditions that may have a direct impact on weight gain: hypothyroidism, insulin resistance, polycystic ovary and Cushing’s syndrome. If you have or suspect you have any of these, or if you follow a clean diet and healthy exercise program and not losing weight, consult your doctor. Managing how much we eat will be the focus of this post because in my opinion it’s the easiest to tackle. The portion size of our food has gotten out of control. Have you ever really sat back and looked at the size of a 32oz soda cup from Mc Donald’s? Those things are huge! 265 calories and 73 grams of sugar! 3 times the recommended amount of no more than 25 grams in an entire day! That’s unacceptable and totally unnecessary! This is a triple whammy to your immune system and gut! 3rd the sugars eat away at the good bacteria in our gut. And we do this over and over again day in and day out. Sciencedaily.com says overeating increases the immune response system causing it to generate excessive inflammation, which may lead to a number of chronic diseases. Inflammation! This is the culprit. This is the root of the problem for so many adverse health conditions and chronic diseases. The reason I wanted to focus on overeating is that’ it’s an easy fix that can be implemented immediately. Regardless of the diet, it always comes down to calories. Eat too many calories and you will gain weight, too little and you lose weight. It really is pretty simple but not always easy to follow, especially for those who eat out a lot and cannot control how much of what goes into the food preparation. So just by eating smaller portions of food you will take in fewer calories and fewer calories equals less weight. According to the Mayo Clinic, 3,500 calories equals 1 pound. You need to burn around 3,500 calories to lose 1 pound. Cut out 500-1000 calories per day, you’d lose 1-2 pounds per week. Now that you have an idea about calories and the calories of some common foods you should be able to see that just by having one cup of chocolate ice-cream instead of two you will save 285 calories. While that may not result in substantial weight loss, it is a start. Measure out your food, especially oils, butters, sugars, etc. By measuring the ingredients, you can control exactly how much of each ingredient goes into the dishes. The more experienced you get at this the easier and faster it becomes. Small bowl and plates makes are meals appear bigger and fuller than they are. Make single serving packs of food ahead of time. Label them for convenience and make them easily to grab on the go. You will get out of portion control what you put into it. If you make the conscious effort to really eat less, you will see results. The kind of results you will see will depend on how must dedication and for how long you continue controlling the portions you eat. However, if you feel like you want more, if you want to really take portion control to the next level, intermittent fasting is the next logical and healthy option. Intermittent Fasting (IF) is a lifestyle choice whereby you eat your total daily caloric intake within a daily window of time and fast for the remainder. What you eat and how much you eat is not what’s important here, it’s when you eat that’s important. The hope would be by eating in a tighter window one would consume less total calories and will lose weight. However, IF isn’t just for those looking to lose weight. Everyone can benefit from intermittent fasting, even a body builder! Bodybuilders need to adjust their portion sizes during their eating window to make up for any calories missed during the shortened eating window. According to a recent study in 2014, IF was found to reduce bodyweight by 3-8% over a period of 3-24 weeks. People lost about .55lbs (.25kg) per week with IF, and 1.65lbs (.75kg) per week with alternate-day fasting. Alternate-day fasting consists of 24 hours with no food, then a ‘feed’ day of 24 hours and repeat. These results are in addition to a 4-7% reduction in their waste, suggesting they lost belly fat. This may be due to ketosis, a process when the body feeds off its own fat for energy after utilizing its stored glycogen reserves. Ketosis is the desired results keto dieters hope to achieve. Let’s take a look at four examples of common intermittent fasting protocols. 5:2 Consume 500-600 calories on two non-consecutive days. You simply eat what you can in a 1-hour eating window. I started intermittent fasting in early 2017 and it’s truly how I prefer to eat. I started skipping breakfasts and simply had my first meal around 12:00pm (16/8) and gradually progressed to eating once a day. The OMAD protocol is how I eat most days and prefer this way of eating. Overall I feel lighter, much less bloat, more energetic, the list goes on. IF has truly been life changing! IF is not just about eating less for weight reasons, there are some amazing health, cellular, and hormonal benefits as well. Weight loss: As mentioned above, intermittent fasting can help you lose weight and belly fat, without having to consciously restrict calories. Insulin resistance: Intermittent fasting can reduce insulin resistance, lowering blood sugar by 3–6% and fasting insulin levels by 20–31%, which should protect against type-2 diabetes. Inflammation: Some studies show reductions in C-reactive proteins, a key indicator of inflammation. Heart health: Intermittent fasting may reduce “bad” LDL cholesterol, blood triglycerides, inflammatory markers, blood sugar and insulin resistance — all risk factors for heart disease. Cancer: Animal studies suggest that intermittent fasting may shrink tumors, as well as prevent cancer. Brain health: Intermittent fasting increases the brain hormone BDNF and may aid the growth of new nerve cells. It may also protect against Alzheimer’s disease. Anti-aging: Intermittent fasting can extend lifespan in rats. Studies showed that fasted rats lived 36–83% longer. In addition, fasting has a positive effect on your cells and hormones. Human Growth Hormone (HGH): HGH is a naturally produced hormone that aids in muscle building and fat loss. This natural occurring hormone decreases with age, but in a fasted state, levels of growth hormone skyrocketed 1,000% for women and up to 3000% in men. Insulin: Insulin sensitivity improves and levels of insulin drop dramatically because sugar isn’t present. Lower insulin levels make stored body fat more accessible. Cellular repair: When fasted, your cells initiate cellular repair processes. This includes autophagy, where old cells are digested and replaced with new regenerated cells. 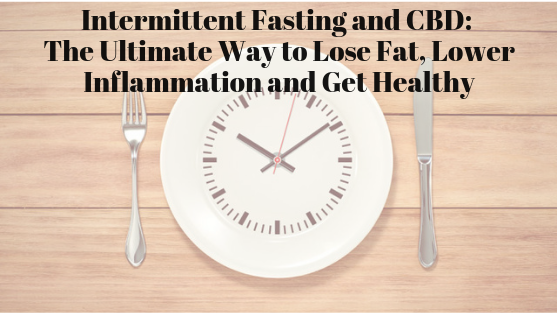 CBD users will be glad to know that supplementing CBD while intermittent fasting helps maximize CBD’s effects and improve the benefits of fasting. CBD has a positive effect on our metabolism and endocannabinoid system, which helps to balance our immune system, cardiovascular health, digestion, mental health, memory, and appetite. Moreover, as your body’s inflammation levels decrease from fasting, your pains, anxieties, arthritic condition, and whatever other inflammation related ailments and diseases you have will improve! When taking CBD, it’s important to remember that some CBD products are made using sugar, like our CBD gummies, and should not be taken during while fasting. Opt instead for a CBD isolate, or our full spectrum green oil with THC or our gold oil that contains a full plant profile minus the THC and original plant materials. Of the two, I prefer our green oil when dosing on a fast, because it contains all the valuable plant materials like chlorophyll, lipids, and waxes. In addition, all of the cannabis plants cannabinoids, terpenes, and flavonoids, are also present allowing for the ‘entourage effect’ that only a true full spectrum CBD oil can offer. In a very few cases, CBD oil based products can mildly upset the stomach when taken on an empty stomach. While this is extremely rare, it is something to note and proceed accordingly. If you’re one of the rare few, simply take your CBD with food at mealtimes. Hopefully this gives you a good base for understanding intermittent fasting, and how with just a little discipline you can start making some serious healthy changes. To learn more about IF and to review published studies demonstrating the various benefits of IF, click here to read Intermittent Fasting 101 – The Ultimate Beginners Guide on Healthline.com. To get started with IF, I suggest starting slowly and work your way up to an 8-hour feeding window. Once there you can decide whether or not it makes sense for you to progress to a 4-hour window. As I mentioned, I started by skipping eating in the morning and went right in to a 6-hour (12pm-6pm) feeding window with no problems. However, I have seen others who tried skipping their first meal and it didn’t fare as well. If that’s you, simply push the first meal of your day out 2 or 3 hours for a week, then another 1-2 hours the following week and so on. Work your way to the desired goal. The more you practice IF the easier it will be. Especially after you start feeling and seeing the results, you won’t want to go back to eating 3 or more daily meals. In the next post we’re going to discuss prolonged fasting, which is when no food and sometimes no water is practiced for periods of 24 hours or longer. These types of fasting protocols are becoming more and more popular and I’m going to sure some amazing health benefits resulting from these practices.